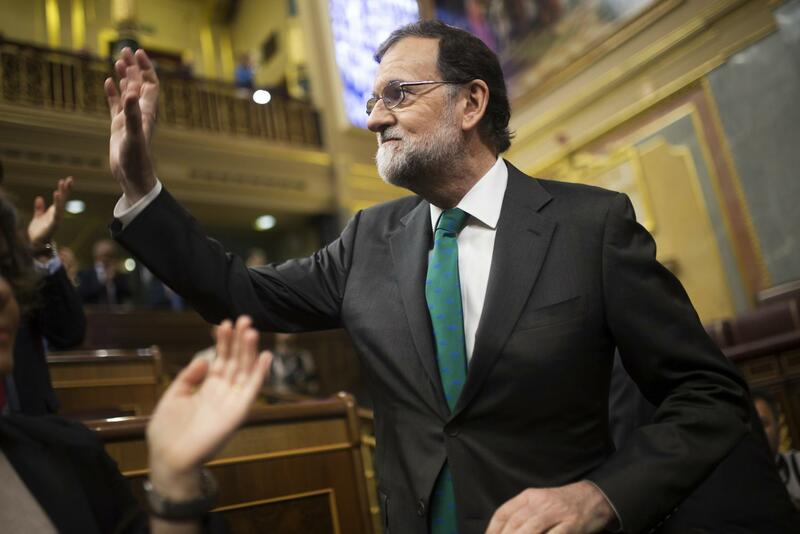 Spain's Prime Minister and Popular Party leader Mariano Rajoy gestures to his fellow lawmakers as he arrives to the main chamber during the first day of a motion of no confidence session at the Spanish parliament in Madrid May 31. Spain's opposition Socialists tried to persuade smaller parties to support their bid to oust Prime Minister Mariano Rajoy's conservative government as they opened a tense parliamentary debate on their no-confidence motion. The unexpected development injected a new element of tension into European Union politics and global financial markets. MADRID — Spain’s conservative government appeared doomed Thursday to lose a no-confidence vote in parliament, with the center-left Socialist party poised to take power. A Basque nationalist party’s announcement that it would vote in favor of the motion spelled the almost certain end of Prime Minister Mariano Rajoy’s mandate and foretold the stunning collapse of his minority government in a parliamentary vote Friday, when it will be short of support to survive. Officials of Rajoy’s Popular Party dismissed speculation that he might resign ahead of the vote. “The PP has faced up to all the problems that have come its way,” party secretary-general and Defense Minister Maria Dolores de Cospedal told reporters, adding that Rajoy would be present for the ballot that’s expected to oust him. The impending downfall of Rajoy’s government after ruling for nearly eight years came just days after the Popular Party’s reputation was damaged by a court verdict that identified it as a beneficiary of a large kickbacks-for-contracts scheme. The unexpected development injected new tension into European Union politics and global financial markets, already unsettled by Italy’s struggles to install a government since a March 4 election. Under a Spanish law that prevents a power vacuum, Socialist leader Pedro Sanchez, who tabled the no-confidence motion, would immediately become the new leader of the 19-country eurozone’s No. 4 economy and a prominent EU leader at a time when the bloc faces numerous challenges. Unlike Italy’s potential new leaders, Sanchez hasn’t expressed skepticism about the EU or the continent’s single currency, both of which are broadly popular in Spain. In the no-confidence debate, Sanchez, 46, called on Rajoy to step down over the kickbacks scandal. Rajoy responded by accusing Sanchez of a power grab. “Everybody knows that Pedro Sanchez is never going to win the elections, and this is the reason for his motion, his urgency,” Rajoy told lawmakers, reminding them that the Socialists lost two general elections under Sanchez’s leadership and warning that a Socialist government would endanger the country’s financial stability. Sanchez promised to abide by a national budget recently negotiated by Rajoy. It includes substantial benefits for the Basque nationalists whose promised votes in the no-confidence debate opened the door for Sanchez to oust Rajoy. Sanchez also vowed to open talks with separatists in the Catalan regional government over their demands for independence, which has dogged Spain for the past eight months. In the process, Rajoy faced down opponents who complained that the recovery came at the expense of austerity measures, just as he successfully stood up to Catalan secessionists. But the strong economy wasn’t enough to keep Rajoy in La Moncloa Palace, the seat of government in Madrid, and he was undone by the corruption scandal. Last week, National Court judges delivered hefty prison sentences to 29 business people and Popular Party members, including some elected officials, for fraud, money laundering and tax evasion, among other crimes. The Popular Party was fined $287,000 for benefiting from “an authentic and efficient system of institutional corruption.” More damagingly for Rajoy, the judges questioned the prime minister’s credibility when he said in court that he was unaware of the fraudulent accounting. Sanchez appeared to have the absolute majority in the Congress of Deputies — 176 of 350 seats — required to unseat Rajoy. 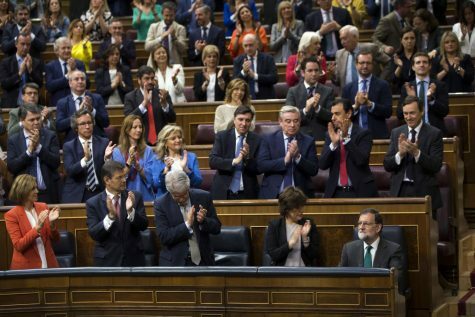 Spain’s Prime Minister Mariano Rajoy, lower row right, is applauded by his fellow lawmakers as he arrives to the main chamber during the first day of a motion of no confidence session at the Spanish parliament in Madrid, May 31. Spain’s opposition Socialists tried to persuade smaller parties to support their bid to oust Rajoy’s conservative government as they opened a tense parliamentary debate. Spain’s anti-establishment Podemos party proposed Sanchez to form a broad coalition government and a left-wing alliance to win the next general election, which Socialists have promised to call before the end of this year. “Today, finally, we are sending the Popular Party home,” said Podemos leader Pablo Iglesias, who called for Sanchez to implement an ambitious social agenda and to undo years of austerity measures by the conservatives. Ciudadanos leader Albert Rivera, whose center-right party is leading recent polls, formally announced his lawmakers would vote against the motion Friday. “I don’t want a corruption-marred ‘zombie government’ but neither a ‘Frankenstein government’ with those who want to break Spain apart,” Rivera said.